When United Star Fighters Incorporated first got into the aerospace industry, it was with the Star Falcon series of fighters, which has since achieved critical acclaim. 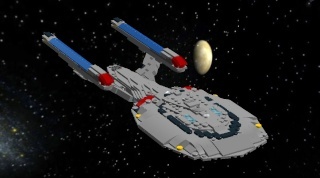 It was also the first truly successful Federation starfighter to take to the skies and beyond during the 26th Century. It was in the wake of the Star Falcon that USFI hoped to produce a bomber as well. The Star Cruiser line of light to medium bombers was the first of such a venture, but it ended up being quite a misfit aerospacecraft. It was slow, had the relative turning radius of a barge, and while it carried plenty of energy weapons it was not strong enough in the true explosive department. As the years passed and continued successful fighters such as the Star Phoenix and Star Interceptor were launched, the bomber segment began to be overlooked. As the Falcon and the Phoenix kept on getting better and better, the Star Cruiser lagged behind. It got two upgrades, once to bring it up to speed, and then for some minor enhancements by an intrepid engineer known as SpitfireMad. Now that Star Force's bombing sector has effectively been taken over by more capable, purpose built attack craft such as the Starling, Shrike, and Raptor classes of aerospace craft, there is pretty much no room left for the old Cruiser to make its mark. That's why we're building a new one. Make way for the Star Cruiser III. When it is approved, an LXF file can be found here. The old Star Cruisers were slow and could not turn. The new Star Cruiser comes with engines off the latest Star Phoenix (to be posted), and is much shorter in both length and height, and is a bit wider too. These dimensional changes have improved maneuverability so much that during flight testing, in combination with the power increases, the test pilots have decided to no longer describe the Star Cruiser as a land yacht, but rather as a speedboat. That really is a compliment, coming from them. Weapons wise, the Star Cruiser has lost a few phaser cannons, with the ones it still has getting power enhancements. The dimensional tweaking in the nose has also allowed for a larger torpedo bay, so the Star Cruiser has an extra 30% of micro photon torpedoes to barrage targets with. The rear gun has also received power upgrades, and a new bomb bay in the shortened tail section is capable of replicating physical munitions. It takes a lot of power, though. The Star Cruiser III has also received some equipment upgrades for its power, flight control, and targeting systems. Finally, as with the latest USFI aerospace craft and their versions, the conventional landing gear has been completely done away with, and been replaced with antigravity thrusters. The Star Cruiser III is no exception. Production of the Star Cruiser III is to last for the next nine months, with units expected to hold the medium bomber role till a newer, more advanced bomber can take its place. Hehe, we won't need to make way for that thing because it's so tough it'll probably just make it's own way. I like it! The wing config reminds me of the ARC-170 starfighter. Also, what did you mean by "true explosives"? The term sounds very dangerous, yet oddly compelling. By that I meant really big and powerful bombs. It's beautiful. Powerful. Mostly streamlined... I love it! My ONE suggestion is to get the armor second between cockpit "glass" to be flush with the "glass"